On May 12th, Alyssa, Ravenna and I went to Fibrefest International 2007 convention, in peaceful Abbotsford, BC. Besides learning that I’m allergic to llamas and /or alpacas (which were in abundance), I also had a chance to speak to people at two booths which directly relate to this art project. 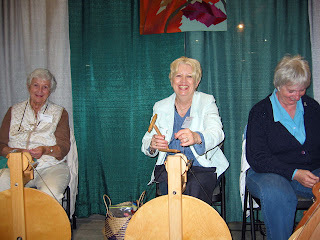 The first booth was the Peace Arch Weavers and Spinners Guild. They let me try my hand at one of their looms. Quick lesson here: Weaving by hand is very, very time consuming! But it’s also fun. I talked to them about appropriate material for creating a painting canvas. They were all in agreement that flax (linen) would be the way to go for canvas material, as wool and other animal fur won’t hold the paint as well. The downside to weaving linen, however, is that it has very little stretch compared to other fibers. This means that it’s easier to make errors, creating an irregular canvas surface. And Damien Hirst just hires people to do his art for him. OK, I think that’s going just a little too far. Colleen Hovey is the owner, and gave me an impromptu lesson on how to use a drop spindle, to spin fiber into thread. She sells a wide variety of fibres and is a dealer for Kromski Spinning Wheels, shipping throughout Canada and the United States. I was planning on buying some flax from her to learn how to spin fiber as a proof-of-concept for the flax that is growing at my parent’s house. But when I told her about my project, she donated 50 grams to the cause! 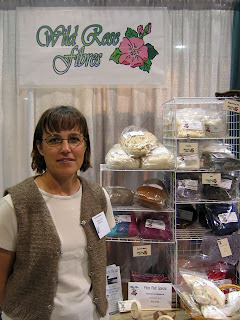 So, if you are thinking about spinning your own yarn, please visit her website! I’ll be giving an update on my spinning & weaving results in the coming months. Coming up next, Bamboo gathering. It worked for the Skipper & Gilligan, so why not me?